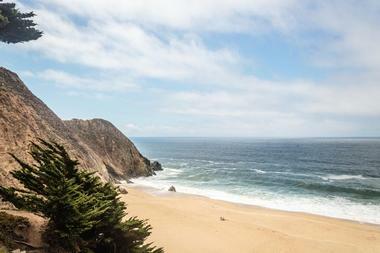 San Francisco residents and visitors have a large range of beaches to choose from on a nice sunny day. 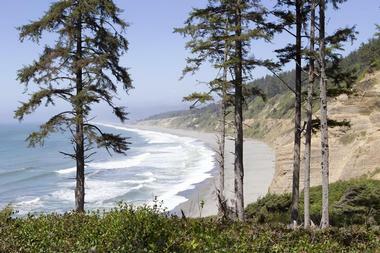 Most of the beaches, like Agate Beach, are great for long walks and fantastic views. Some, like Baker Beach, are so popular you might find a crowd on a sunny Sunday. Beaches like Ford Funston are so windy most of the time that swimmers stay away, although hang gliders love it. Ocean Beach is great surfing beach and Pescadero Beach is great for spotting sea lions and collecting mussels. Agate Beach Park is a public fishing access near the town of Bolinas in Marine County, with 2 miles of fantastic diverse beach area. It is great place for long walks – it is surrounded by wildflowers and at times you can spot sea lions and thousands of birds. The park is best known for Duxbury Reef, which, at low tide, has huge tide pools filled with fish and other marine life. The sandy beach is wider as you go north. but be careful not to get cut off by the incoming tide. The best view of the area is from the bluff near the parking lot. You can see Farallon Islands when the weather permits. 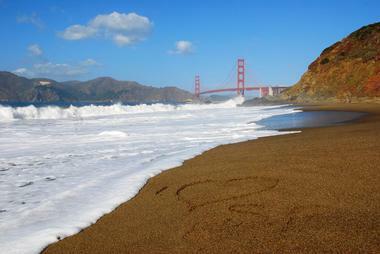 Baker Beach is a mile-long scenic sandy beach stretched along the shoreline in southwest Presidio. The beach is very popular on those rare sunny days and the PresidiGo Shuttle will take you to the shore. Most people come to this lovely natural beach for sunbathing and for the unique view of the Golden Gate Bridge, Lands End, the Marin Headlands, and the ocean. There are picnic tables and a few grills. As you stroll along the beach, you can spot brown pelicans, red-tailed hawks and, between the rocks in the shallow water, colorful sea stars. 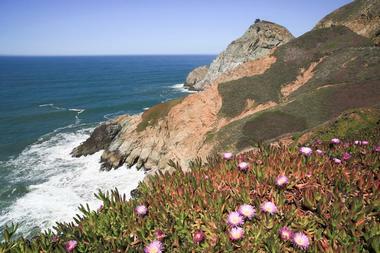 If you feel like hiking, climb the Sand Ladder to the California Coastal Trail; it will link you to the Batteries to Buffs Trails and Marshall’s Beach. 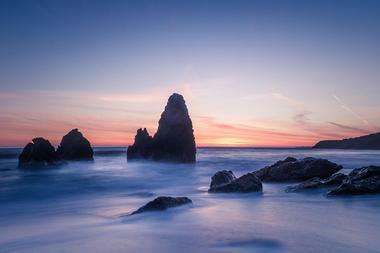 Devil’s Slide Coast is an 8,900-acre network of marine areas and protected lands north of the Devil’s Slide Tunnel. 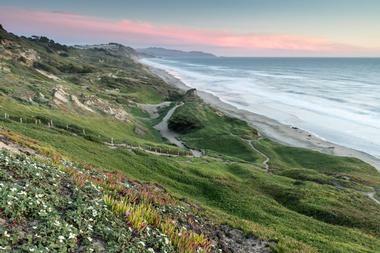 It stretches between Half Moon Bay and Pacifica, all the way to the popular Mavericks surf break. It includes such diverse landscapes as ridgelines, beaches, bluffs, tidepools, important ocean habitats, and historic sites. The Devil’s Slide, part of the California Coastal Trail, is accessible through the Devil’s Slide Tunnel on Highway 1. The trail can also be used for horseback riding and biking and provides easy access to the coast for surfing and fishing. A part of the Golden Gate National Recreation Area, Fort Funston Beach is located on the southernmost point on the San Francisco Pacific Coast. The beach is very windy, and the edge of the bluff offers a popular platform for hang gliders. There are scenic hiking trails running along the bluff. Two routes will take you down to the beach, whereby the most direct is the southern route, with many steps and a steep sand ladder. Once you arrive and turn left, you will get to Phillip Burton Beach. The longer northern route makes a large loop and passes by some interesting graffiti on the concrete building. There are lot of sand dollars and fossils in the sand. At the parking lot you will find a small wooden observation platform with fantastic views of the beach and the sea. Bikes and horses are allowed in the park and so are dogs on a leash. Located about 10 minutes from Half Moon Bay, Martin’s Beach is a very pretty cove with a few picnic tables by the water. As you go south towards the steep cliffs, you can find some interesting caves. To reach the beach, you will have to hike down the hill to the shore. The beach is a hidden, fairly unknown spot and you might find yourself alone on its wide sandy expanse. It offers fantastic views, but the sand is often covered in seaweed, making the water less attractive for dipping. The beach has been a subject of a dispute as a rich developer bought the land around it and gated the beach access, what is against the California law. 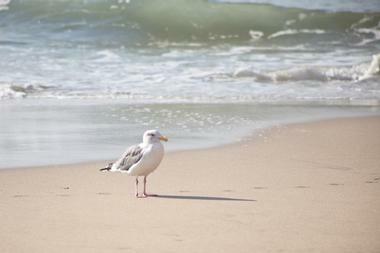 Years of lawsuits ended up in the beach being open to the public again, but no efforts have been made to make it more accessible or to provide facilities. Ocean Beach is a part of the Golden Gate National Recreation Area and is located in the Richmond District, next to Golden Gate Park, with the Great Highway running alongside. The Cliff House and the former Sutro Baths are located at the beach’s northern end. In the spring and summer, the beach is often hidden by fog, but that does not stop the surfers and bonfire parties from enjoying this lovely sandy spot. The water at Ocean Beach is known for large waves and very strong currents, making it dangerous for swimming but a delight for serious surfers. 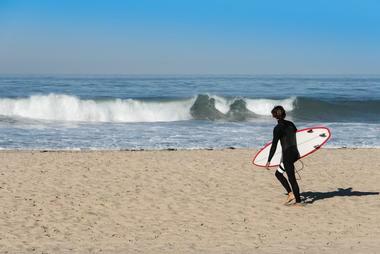 Although the water is cold, the beach is one of the top surfing spots in the Bay Area. Pescadero State Beach is located along State Route 1, about 14.5 miles from Half Moon Bay and 1.5 miles from the city of Pescadero in San Mateo County. This lovely mile-long shoreline offers a mix of rocky cliffs, sandy coves, tidepools, picnic facilities, and fishing spots. Just across the highway is the Pescadero Marsh Natural Preserve, popular with bird watchers and nature lovers. You can spot blue heron, deer, kites, raccoons, foxes, and skunks, which are protected in the preserve. If you keep walking north along the hard packed sandy beach, you can reach San Gregorio State Beach and Pomponio State Beach. This habitat is often occupied by harbor seals and Steller sea lions. You may also spot people collecting mussels or fishing along the shore. 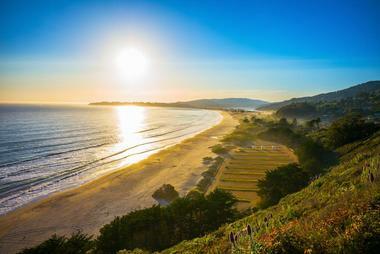 Stinson Beach is located about 20 miles from San Francisco next to the Mount Tamalpais State Park. 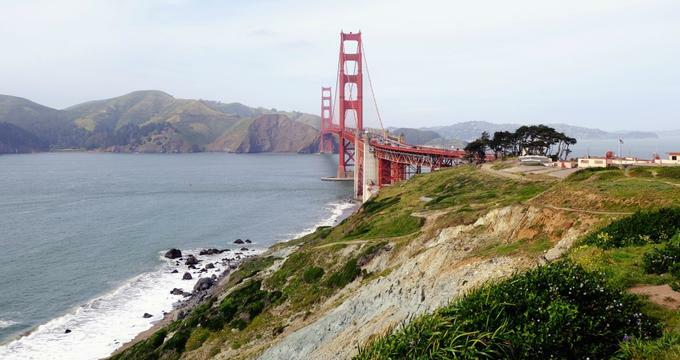 Only a 35-minute drive from the Golden Gate Bridge, the beach is very popular with the residents of the San Francisco Bay Area as a fun day trip. The wonderful white sand makes Stinson Beach one of the best beaches in Northern California for swimming. It is also fun for hiking, surfing, picnicking, and generally enjoying a day in the sun. You will spot people surfing, wind surfing, hang gliding, kayaking, and enjoying other water sports. There are a few places along the beach renting the equipment if you did not bring yours. There is always a game of volleyball going on at the beach. There are also several picnic tables and grills and a few trailheads leading to Mount Tamalpais State Park. Fishing is also fun just off the beach.